When you walk into Sticky Fingers BBQ you notice 2 things. 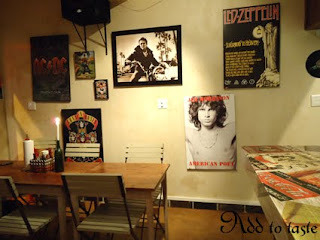 Firstly the thick wall of delicious grill smell and then the great posters on the wall. Closer inspection gives you a great! pinup bar counter and bottlecap holders. The atmosphere is friendly and inviting and the music, well its up to the crowd says the owner and I proved it by pulling funny faces on songs I didnt like till they played one I did and I smiled. 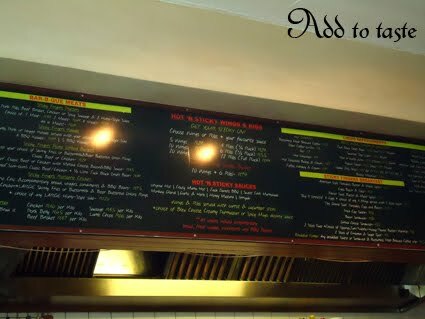 Look up if you want a menu, nothing on the table jus ton the wall over the grill and everything is on there. Add to that 3 cups of coffee and 2 cool drinks. The total bill came to R178. Nope I didnt forget any zeros, that was really the whole bill. The owner is really friendly, even came round to give everyone free vodka jelly shots (normally R10). Man they tasted like high school. The guys who work there are both waiters and cooks and everyone is very friendly and helpful. you get a knife and fork but only cause so many people have asked, if it was up to the owner you wouldnt get any, even the "garden salad" is served as veggie sticks so you can eat it with your fingers. No waist of time with serviettes, you get a whole role of kitchen towel. I will go back for sure, had a great and a great meal. when you next coming to visit us? can you sneak the missus with you next time? love the way you mixed things up with a restaurant review! Must remember to do a few of those myself. This looks delicious, but when in Obs, you should also try the DIVINE 1890 House. Cheap, delicious sushi and chicken food. the deep fried wontons and crispy tuna will be my END! 1890 is one of my favourites. Actually went there for a memorial dinner the other week. It was my friend's happy space when she was in obs and her biggest problem with grahamstown was that she had no sushi. The address is there under the raiting, in station road.